The dreaded double-header. When one game of softball won't do, where we have to play another immediately after. This is a result of previous games being rained out. Imagine that, games being rained out in Vancouver. Surely that doesn't happen very often. No... in Vancouver? Excuse my sarcasm; but endless crappy weather for the last 2 months has not made me a happy camper. Mind you, I'm not a happy camper in general because I absolutely hate camping. My idea of camping is staying at a Motel 6. Call me pathetic, I don't mind. Camper I am not. So playing the actual double-header is really no trouble since I like to keep active. However, there are 2 issues. First, it further delays my eating. Second, being that we end later, there are fewer dining options for a Monday. The games actually went by pretty quickly since we handily won both. It was nice to see the other team still have fun despite being thumped twice. Afterwards, we contemplated a few choices including the current special at the Hamilton Street Grill ($13.00 steak dinner!). However, Boss Woman kept whining about going into Yaletown. My goodness, it's a Monday and it was getting close to free parking time anyways. What's there to complain about??? Then she said it would be a better idea next week when we play at Canarvon. Uh... That's not much closer than Montgomery Park to Downtown. The reason? Because I was scheduled to drive her that night. For the love of... I'll leave it at that. Maybe I should change her name to Fussy Woman! 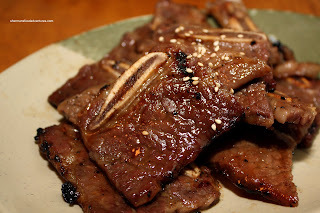 So we ended up going to a place nearby that I've already blogged about. No matter, it's all good. The last time I was at E-Bei, I had forgotten my camera; thus we had crappy pictures from Rich Guy's cellphone. I was more than happy to return to not only redo some photos; but to see how things are going more than a year later. Last time I was here, it was for the late-night AYCE for $12.95. A decent deal except for the fact that most of the items available are not necessarily the most desirable ones. I don't blame them, most other late-night AYCE Japanese restaurants have similar menus. Well, this time, we were 30 minutes from the late-night menu; but we stuck with the regular AYCE since we really wanted the good stuff (well as good as it can get in an AYCE environment). As you know, I'm not really into the AYCE Japanese thing anymore; yet I still do it for "research" purposes. With recent experiences at Kawawa, Sui Sha Ya and Il Uk Jo, my research is becoming dangerous proposition! Well, at the very least, I knew what we were getting into this time. I've been to E-Bei a half dozen times before. I normally talk about items as they arrive; but there was no way I could keep track. You see, almost everything showed up at once fast and furious. I could barely keep up with the pictures! Now this would usually scare some people because that would indicate pre-prepared food. Not in this case, items that should be cold were cold and hot things were hot. Don't know how they did this so efficiently... I don't want to know honestly. Anyways, I'll start with the Kaki Pon (raw oysters on the half-shell). I am quite skeptical of raw oysters in an AYCE meal; yet these were actually decent (not mushy or fishy). 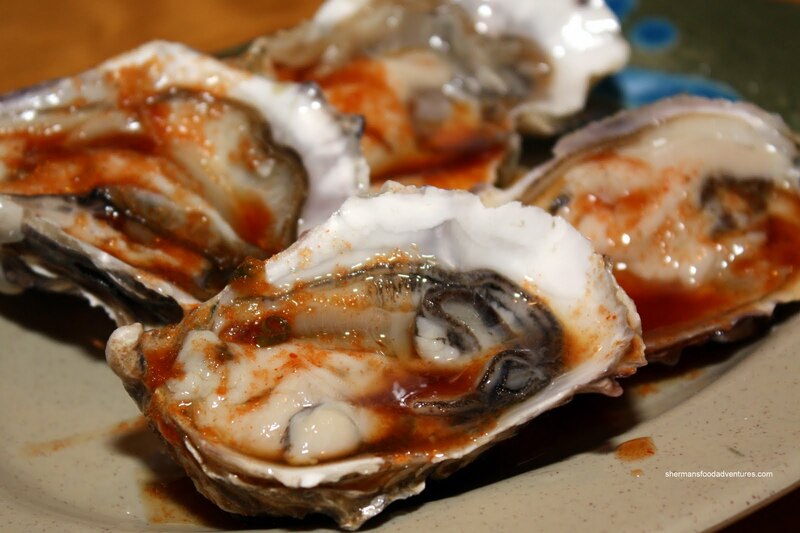 I really had no idea what type of sauce was on the oysters though. It was slightly spicy and sweet. The same could be said about the Sashimi (tuna, salmon, tako, hokkigai and spicy salmon). Decent for AYCE. It appeared, smelled and tasted fresh. I especially liked the tako. It was slightly chewy while still being quite tender and sweet. As for the Nigiri, there is a substantial selection and we ended with 2 plates. The first plate was mostly masago, tobiko and ikura. Not exactly my favourite; but loved by Miss Y and Bear. 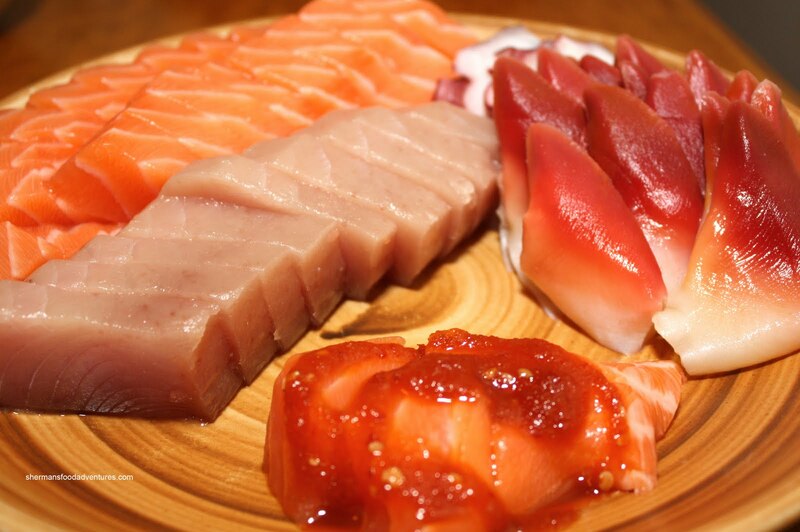 The second plate was comprised of mirugai, shark's fin, abalone and lobster. 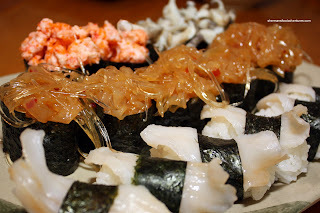 Except for the mirugai (geoduck), all the other items are imitation. I believe the "abalone" to conch. I personally liked the mirugai the best since it was a bit crunchy, a tad chewy and naturally sweet. The sushi rice was pretty average being bland and slightly gummy. Thus, the various Maki Sushi were alright. 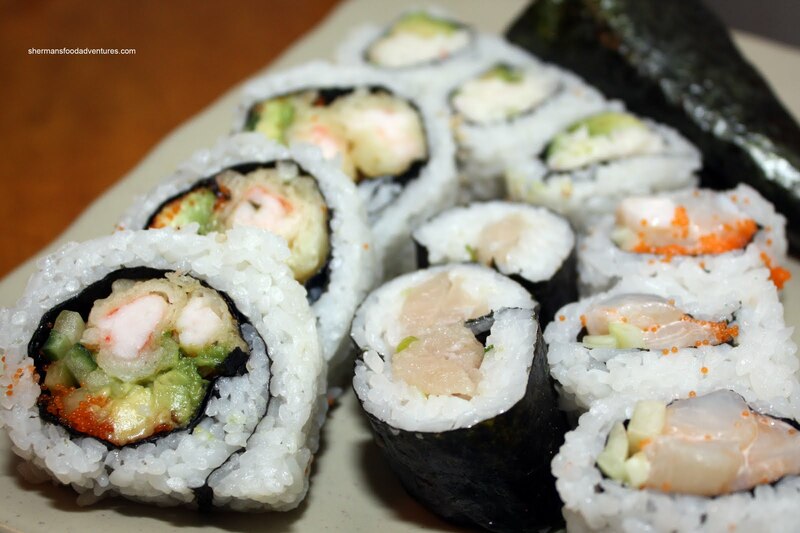 The same average rice essentially limited how good the sushi could be. Too bad really, the ingredients were actually decent. 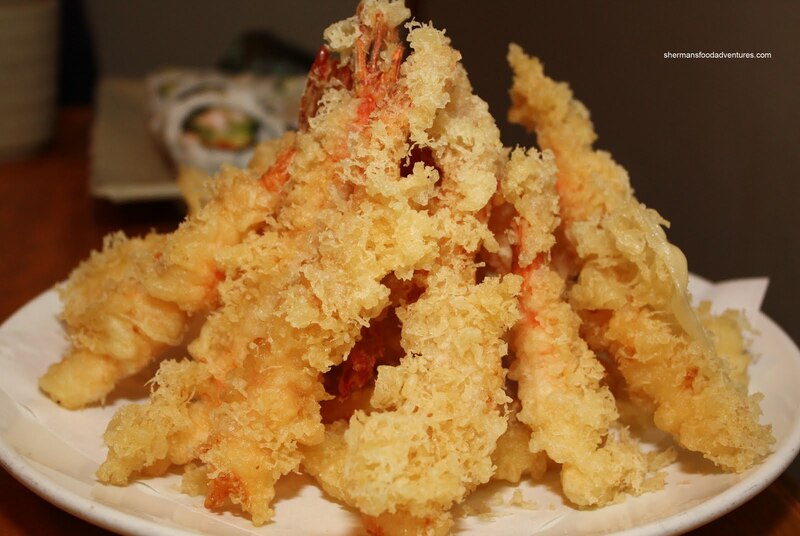 We also got a whack load (not sure how much that is) of Prawn Tempura. Although there was too much batter on most pieces, the tempura was still crunchy. However, with so much batter, it was a bit too crunchy. We ended up with 2 separate orders of Beef Short Rib and Bear pretty much ate all of it. What can I say. He's a short rib, dessert, mushroom-hate bear. I have to admit that the short ribs were pretty darn good. They were tender, flavourful and quite lean. Another standard item in AYCE is the Chicken Karaage (most likely chicken wings). So of course we ordered it. I think we do that by default despite the fact we wanted it or not. 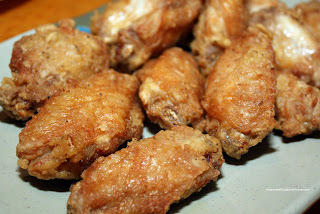 These were pretty much what you'd expect out of a fried chicken wing. Admittedly, these were good. Juicy and flavourful on the inside and crisp on the outside. 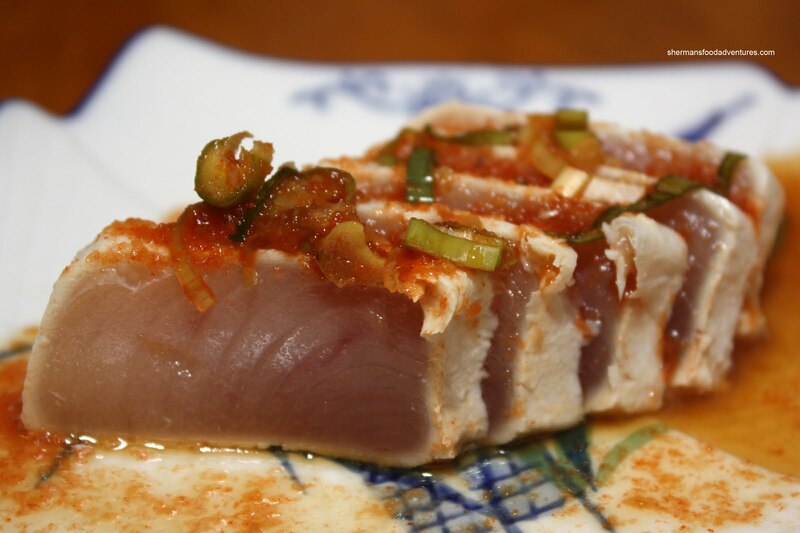 Moving along to the Tuna Tataki, it was surprisingly decent as well. Seared evenly on all 4 sides while dressed in some form of vinaigrette, it had both a nice texture and flavour. 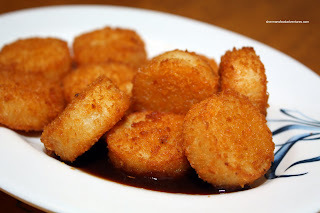 Now to another "imitation" item which was the Fried Scallops. The fact they are uniform in shape and taste like pollack would easily indicate that they are not scallops. Despite this, they are what they are and if you like it, they were fried nicely. I'm personally not all that enamored to deep fried pollack. 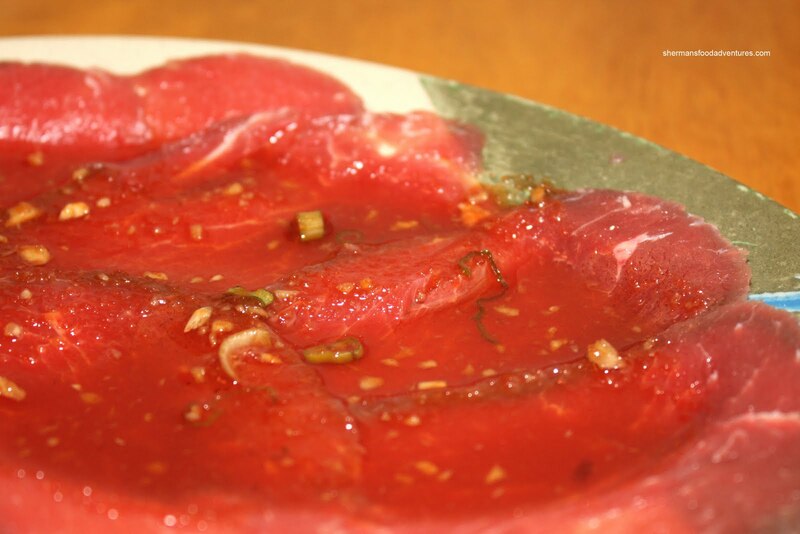 One item that can go horribly wrong in an AYCE Japanese meal is the Beef Tataki. So many times it has been cut too thick, served frozen or in Kawawa's case, suffering from serious freezer burn. Although the one here was not stellar; once again, it was decent. Sliced thin enough, thawed completely and dressed with ponzu, this did not offend. 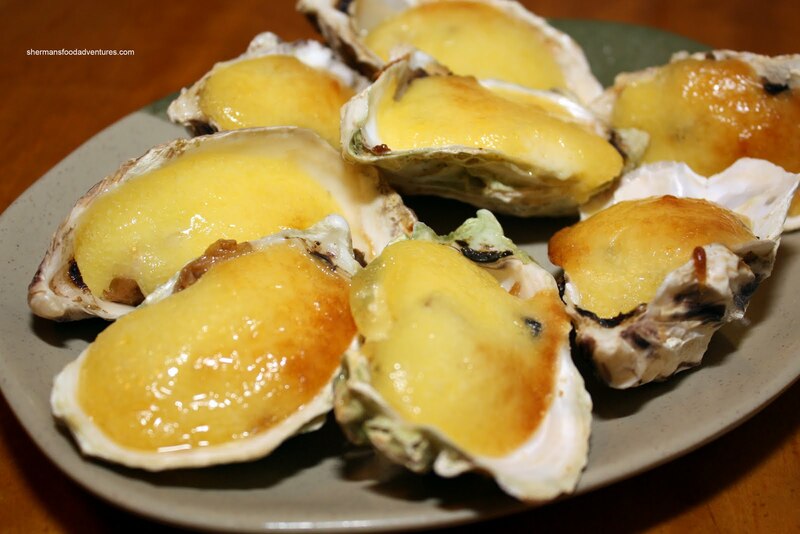 Although we had many more items, the last one I'm going to talk about is the Oyster Motoyaki. It's almost a shock these days we find oyster motoyaki served in its own shell. Increasingly, we get it in a tart tin. Yah, I know it is more sanitary; but it just doesn't look right. I found the motoyaki pretty average. The sauce was a bit stiff and flavourless. Thus, the oyster became a bit lifeless. However, most of the meal was decent, especially considering it was an AYCE. Definitely a cut above places like Richmond Sushi, Kingsway Sushi, Top Gun and Fish on Rice. In terms of service, it is much better than Fish on Rice (which is notorious for its crappy service). It can give Ninkazu and Tomokazu a run for its money in terms of acceptable quality for an AYCE. 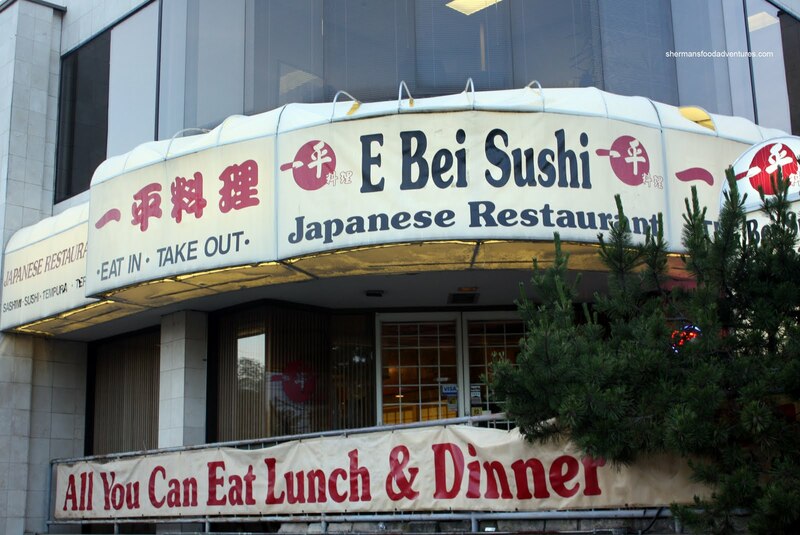 Of course AYCE is never a great way to get quality Japanese food; but if you must, E-Bei is alright. I am sure that you went past from dinner time to the late night time threshold. In that case, did they still let you order from the dinner menu? Kim, we went for the regular dinner AYCE. More choice really. I'm gonna tell Boss Woman to take a hike! Trisha, I'll admit it, I've been here many times before and the AYCE is decent. Not great, but decent for what it is. Can you do a review for Tokyo Ichiban in Richmond please? ?